She is a great professional. The wait time took a little longer than I expected but I am sure the reasonis because she explains everything and take her time with each patient. She is awesome!! I would highly recommend her. She is a great professional. The wait time took a little longer than I expected but I am sure the reason is because she explains everything and take her time witheach patient. She is awesome!! I would highly recommend her. The overall experience was very pleasant. The doctor made me feel at ease and was not rushed to get through theappointment. She was thorough in her questions and examination. The staff was very professional and courteous and the office was very clean which is very important! I will definitely be coming back and recommending to others! The overall experience was very pleasant. The doctor made me feel at ease and was not rushed to get through the appointment. She was thorough in her questions and examination. Thestaff was very professional and courteous and the office was very clean which is very important! I will definitely be coming back and recommending to others! Dr. Valdes received her Medical degree from the Higher Institute of Medical Science of Havana, Cuba. She completed a Family Medicine Residency at Pedro Fonseca Policlinic Center of Havana, Cuba. In addition, Dr. Valdes completed the Family Medicine Residency program with honors at the University of Medicine and Dentistry of New Jersey (UMDNJ) as well as at New York Medical College. Dr. Valdes is board certified by the American Board of Family Medicine. She is also a member of the American Academy of Family Physicians and of the American Medical Association. 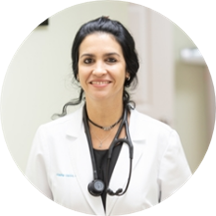 Dr. Valdes recently opened her own practice, Valdes Medical Center, where she focuses on offering the best of her experience. She is also currently an independent contractor at the Baptist Urgent Care System where she holds privileges. Dr. Valdes is a very knowledgeable & professional doctor; Who has an excellent medical team. I Recommend her to everyone! Dr. Ariadna was very professional in her demeanor and answered any questions I had. The wait time was not long at all. Her staff was great as well. The process went smoothly. I highly recommend them. They called me in the morning to cancel because my doctor was sick, which is understandable. However, the person that called was incredibly insensitive when I asked to please call a prescription in to the pharmacy. I understand if she cannot,but bed-side manners would be nice. This person is routinely quite cold & rude. Highly professional, very nice Dr I would definitely recommend her to anyone. Excellant highly reccomend! Dr Valdes listens, and truly cares for her patients your concerns are also hers. Thank you. Dr Valdes takes the time to give the highest quality of care. Both my husband and I LOVED Dr, Valdes! She listened to us so well and probed when needed. Her recommendations were perfect for us. We are glad to have found our Primary Care Physician. Very professional, very polite and very knowledgeable. It shows that she cares for her patients and she’ll go above and beyond for you! Her staff is very polite and courteous as well. 100% recommend! She is an amazing doctor. She is genuinely concerned about her patients! I was surprised not only with Dr. Valdes but also with her staff. Great experience. A doctor who truly cares about her patients! Finding a doctor you can trust and talk to who truly listens is hard. This one is a real gem! Thank you for truly caring about your patients. I appreciate you and yourstaff going above the norm to provide great service. Waited over an hour and spent maybe 5 minutes for the physician. This is not the first time this has happened. Dr. Valdes clearly overbooks her calendar daily. Great doctor, very knowledgeable and caring. Dr Valdés is a physician from heart .When she is with you in the office ,life is so beautiful and you start to heal with her treatment and recommendations. This doctor was amazing with me. It was my first time and she was exceptionally thorough, incredibly caring and very proactive as to our next step in my care. I highly recommend her and her equally competent staff. Very attentive staff. Thorough examination. Both doctor and staff explain what they are doing. Caring, attentive, actually makes time to listen and understand your problems, she connects dots and is very thorough. She is really great!!! She doesn’t treat you like the general medical manufacturing line- in, and push unnecessary drugsin your system using the first thing u say. The office staff is equally great. Very nice staff. Dr. Valdes was very nice! I went to see Dr Valdes for my annual physical. The treatment was great, everyone was very welcoming and nice. The doctor was excellent. I would definitely go see her again. La doctora Ariadna Valdes y Mario son unos profesionales en todo el sentido de la palabra. Se toman el tiempo para atender todas las necesidades de sus pacientes y te explican las cosas como son. Sin duda mis médicos de cabeceray no hablar del trasto con mis hijos, excelente!!!! Gracias por tanta ayuda y gentileza. Very attentive to every word I had to say. She makes you feel comfortable to open up to her easily. And what I loved about it is that she listens to everything you have to say before checking you! She has helped me tremendously and will continue with her! Dr. Valdes is very sweet, has great bedside manners, and is thorough. She takes the time to listen to what you have to say and shows tremendous compassion in her work. Fantastic! I highly recommend her. Dr. Valdes is amazing. She’s kind, caring, knowledgeable and friendly. She puts extra effort into making her patients feel better not only physically but also emotionally. First time going and the staff was amazing, Dr. Valdes is very knowledgeable and very honest about all my concerns and questions. Don’t look anywhere else! Dr. Valdes is an excellent doctor with impeccable bedside manner. She's very knowledgeable and down to earth. My only issue is the wait time in the office. I wait atleast an hour last my appointment time to meet with her. Amazing doctor. Got my diagnosis right after struggling for 3 months with other doctors. Dr. Ariadna Valdes listened to all my concerns and demonstrated excellent bedside manners. She helped me with the two separate issues I came in for. She is very knowledgeable, professional, and willing to answer all the questions I might have.The only negative experience I had was the wait time in the office. I waited for about an hour past my appointment time to be seen. Having read the other reviews, it seems like this is out of the ordinary. However, it was still unpleasant to have to wait that long. 1st time patient and I am so glad I found this Dr. Very helpful, knowledgeable & appointment time frame was spot on. If you’re looking for a great Dr, I have found her! Great Bed bride manor. Her staff is courteous and attentive!!!! It's my first time seeing this doctor, but I would go back. I’m so happy that I saw Dr. Valdes. She took her time, listened to every concern, spoke to me like I was intelligent, and was extremely personable. I am thrilled to have found my new doctor!! Doctors staff was attentive and very polite. Doctor took her time to hear my concerns and react appropriately with kindness. Thank you.